What a wonderful way to kick off the “Belmont Stakes Festival” and the final leg of this year’s exhilarating Triple Crown series than a trip out to the “ole’ ball yard” at Churchill Downs. You can watch, wager, wish, and wander all over the historic grounds and sample both live horse racing action and some of the best grub in town. At the same time, get there early enough to watch the kickoff of the Belmont Stakes Festival racing, which you can watch and wager on via simulcasting. Some exciting Stakes events are scheduled there to kick start this week’s excitement. 1st: 4-5-1-6-3…Dream Maker (4) will be making his career debut for the talented team of Mark Casse & owner John Oxley. This one is a 2YO son of Tapit and out of the grand Monarchos mare To Dream About. The mother of this 2YO has already had 4 winners from 6 starters and 1 Stakes Winner, to boot. My Brisnet.com Stat of the Day. Go to www.brisnet.com for all your handicapping needs and products. Simply put, the best in the business. Dream Maker has been training lights out for this barn that does score with .15% of debut runners and the works over at Keenland this Spring have been eye-popping. A slight edge goes here. Fluminense (5) may be the horse to beat, though. This one will make his first start for trainer Steve Asmussen — who has jumped ahead in this meet’s race for the Trainer’s title. Asmussen hits with .17% of those making the debut run, and this one is by More Than Ready, one of the best in the game. This one has been training lights out, as well, and the trainer/jockey combo have hit with a record of 3-2-2 in the last 11 races over the past two weeks. This one cost $410,000 at the Keeneland September Yearling Sale. Ready and Rich (1) has already run one race, over the slop here on May 17. Ran a nice one to a horse that will run in the Tremont Stakes up at Belmont Park this week. Made a nice run of it from the 5 path in that one, and now draws the more preferable inside. If he b rakes well, this one may be tough to catch. I bet the 4-1 across the board and then box the top three numbers in the exacta. 2nd: 4-5-6…Princess Lu Lu (4) could give us back-to-back #4s to start off today’s card. This 4YO Harlan’s Holiday mare drops to the absolute bargain bin for this tilt, and a level that she has never seen before. Won the last time out at a higher level, and the trainer is suspect at “repeaters.” But this one is training well, and looks to be the best in a soft crowd. Acumen (5) drops a notch in here after running fifth last time out. Pressed the pace in that one and didn’t make the full run. She is an Arkansas-bred, who has made most of her racing noise and money against other state-bred. Faces open company today and that will be a tougher spot, again. Kate N Abs Reward (6) has only hit the board once in the last 10 tries. But? May be better in this spot, with an unknown jockey to boot. Grasping for straws? I bet the 4 to win/place/show and then box the top 2 numbers in one exacta. Key the 4-5 over/under all the numbers? Tread lightly here. 3rd: 5-2-7-1-4-8-3…I will key on Sky Promise (5) in this spot. I really like him in the last go, and he came with a late rush. But it was too little, too late in that spot — although he closed from 16 lengths out to only lose by 21/2 lengths. Drops farther down the class order today, and gets the meet’s leading rider in the saddle for a return visit. If he can motivate this son of Sky Mesa a little bit earlier, I think they have a “promising” chance. Son of a Saint (2) drops in class for one of the top trainers on the grounds. Has only one third in three previous tries over the sod, but has the breeding to like it. Trainer scores with .35% of those switching from dirt to turf. Gets blinkers for the first time today, and the trainer hits with .20% of those getting the glasses for the first time. Second off the layoff and the trainer hits with .27% of those. Adds up to contender here. Cruz Diez (7) is 2-1 ML odds, and obviously has a big shot with the considerable drop in class for this one. The shorter distance today, should help, too. Has hit the board in three of the last four tries — and had the blinkers on each time for those. Has only one win in 17 lifetime starts, so I focus on the underneath versions. I bet the 5 to win/place/show and then key the 5 over/under all the numbers listed. 4th: 3-8-2-4-9-7-6-5…A wide open affair here, but I finally settle on Ship Stalker (3). This one goes for the barn of Brad Cox, who is trying to close in on the Trainer’s Title, too. He switches from turf to dirt, and the trainer hits with .25% of those making this surface switch. More importantly, this one gets a huge class drop and the conditioner hits with .31% of those dropping this drastically. Nice work up at Indy on May 30. Hot jockey/trainer combo who have hit for 2-0-1 in last 4 starts together. Tap You’re It (8) offers a little value at 6-1 ML odds. This one will make his first start East of the Mississippi, and gets a new trainer to saddle him. Blinkers come off and he has a nice morning prep on June 2. Veteran jock gets the mount and this one figures to be in a solid stalking spot. First Set (2) will make the debut run for a trainer that is 0-for-13 with those starting the career in the MC ranks. But this one is training well and the trainer is well respected in these parts. Can’t dismiss. I bet the 3 to win/place/show and then box the top 3 in one exacta. I key the top 3 over the rest in a smaller version. 5th: 5-1-2-7-4-6-3…Trading Cash (5) gets a drop in class after running an OK race against winners for the first time in the last out. Before that, he had three solid races in row and finally broke the maiden two back at Oaklawn Park. Last race experience should help, and the trainer does hit with .22% of those returning after being defeated as the favorite. The shorter distance today, dropping back to a flat one-turn mile, could help this one, as well. Likes to be either on or close to the lead. Maximus Dan (1) goes for a trainer who hits with .27% of those getting the third start off a layup. This one fits that category, and drops in class for this one, to boot. This rider nearly won with him three races back, and looks to fit with these. Soul P Say (2) is dropping in class after running against much tougher and Stakes company just two back. Has never been seen at this low a level before, and will be running quickly from the get-go. The mile distance does pose a question, but he may be able to carry that speed farther against the likes of these. I bet the 5 across the board and then box the top 3 in one exacta. I key the top 3 over the rest in a smaller version. 6th: 6-5-9-8-1-2-3-4…I key on the top three numbers in this race, as well, led by Violent Storm (6). This 3YO gelding by Violence will be making the drop into the claiming ranks for the first time ever, and the trainer hits with .34% of those kind. Did win here last Fall convincingly, and now gets one of the hottest riders on the grounds. This one likes to close late, and will need racing room, but should find these kind to his liking today. Jailhouse Kitten (5) broke his maiden in career race #8 last time out when he was dropped back into the claiming ranks. Won with a nice closing move and the rider stays aboard for this trip. The trainer does OK with the move up to face winners for the first time (.16%), and the trainer hits with .24% of those running in the claiming ranks overall. Great Sky (9) is 8-1 ML odds, and if herons back to the same level that he did in his last try on grass — when he won to break the maiden at the Fair Grounds in March — he could offer nice value. Love the switch back to the sod, where he looks most comfortable and the rider has been on a bit of an improve of late. I can’t dismiss. I bet the 6 to win/place/show and then box the top 3 in one exacta. I key the top 3 over the rest in a smaller version. 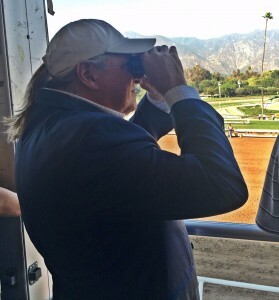 7th: 1-2-1A-5-4…Today’s feature could be dominated by the entry of trainer Mark Casse. Determinant (1) nearly won here in the slop on Derby Day, running a game second to the highly touted and talented King Zachary. Before that, his connections thought enough of him to entry the Toyota Blue Grass Stakes off a MSW win. While that experiment didn’t go too well, he is certainly prepared well enough to try this kind today. The stablemate, He Takes Charge (1A) got the ultimate “equipment change” after the last race. He will run today as a first-time gelding. Has talent, as demonstrated with a nice win at Gulfstream Park back in February — when the good horses where there. Didn’t fare too well in the G2 Fountain of Youth, but has been training well and looks well-suited in this spot, as well. The horse that could give the entry trouble is Iconic (2) — a 4YO trained by Dale Romans. This one ran a game third to the talented Hedge Fund four races back and ran well being second here on May 12. The cutback in distance today should help and the rail post — which he has — is winning at a 20% rate this meet. Trainer hits with .29% of those beaten as the favorite. Look out for this one in here. I bet the 1 across the board, trying to hit both in the money and get a double payoff. I box the 1-2 in the exacta solidly. 8th: 1-11-3-8-6-5-9-7…Zipperini (1) won the last time out for $16,000 price tag and goes today at half that price. The trainer hits with .27% of those getting that kind of class drop, and it is interesting to see that happen after a win. What’s up, one could legitimately ask. But this one gets the rail, and the post has won at 25% rate at this distance this meet. Herald Square (11) could offer the main competition in this spot, and may have been the one to beat if not for the extreme outside post at his sprint distance. This one gets a nice drop in class to a career low level, and did train OK up at Indy on May 29. Won just three starts back at Oaklawn Park, going longer. Should offer value if she can hit the board in here. Ashleys Magens Bay (3) goes for a new trainer for the first time, and he does OK with newcomers to the barn (.14%). Drops down two class levels in this spot, and the trianer hits with .29% of those kind, too. Ran second at Keeneland in the slop two back and has shown some ability in the past, as well. Could wake up today at 8-1 ML odds. I bet the 1 to win/place/show and then box the top 3 in one exacta. I key the 1 over/under all the numbers in two smaller versions. 6th: 1-4-3-7-8…Astoria Stakes: Wonder Stone (1) comes from the barn of Wesley Ward, who tore up the 2YO races at Keeneland and is off to a wonderful (as in …”wonder”) start at Belmont Park, as well. He has put up a record of 11-5-3 for a win percentage of .39% after 28 starts this meet. This filly by Super Saver worked well at Keeneland on May 31 and has done well there since winning for fun in Lexington. Won’t be as easy today with several other good ones. But a solid top choice. Eyeinthesky (3) comes off an impressive win at Churchill Downs and was odds-on favorite that day. And, Steve Asmussen picks up the saddle job on Lady Apple (4) for the first time. That one ran second on debut, but was steadied in the stretch and had to alter course. Should have won that one. I bet the 1 to win/place/show and then key the 1 over/under the others. 7th: 6-10-4-2-7…G3 Intercontinental Stakes: Lady Alexandra (6) won going away at 6 furlongs over the Belmont Park grass course last time out, when saddled for the first time by Graham Motion. Stalked and closed with authority in that one, and now returns in Graded Stakes company for the first time. Looks to have the speed edge and should be poised and ready to get the jump with the running turns serious. Has won 3 of 4 over this grass course and has a win at the 7 furlong distance, too. 8th: 5-1-6-8-9…G3 Wonder Again Stakes: Significant Form (5) has raced only 4 times in her young life, and she has finished first in three of those. The only defeat came in the Breeders’ Cup Juvenile Fillies Turf last Fall at Del Mar. Was 5-wide into the stretch of that one, and still was beaten less than 3 lengths by the then-undefeated Rushing Fall. This one has the speed to press the pace or be on the lead. Looks tough here. I bet the 5-1 across the board and then key the 5-1 over/under all the rest.